With the start of the City Surf Series, now in its second year, with a new event added in Port Alfred and two of the events going to QS 1500, its set to be a good year for Pro Surfers in South Africa. The series started with the first 3 events back to back, starting in Port Elizabeth, then Port Alfred and then East London. Events in Cape Town, the SA Open back in PE and an event in Durban making it the biggest surf series in Africa for a long time. There is also the Vans West Coast Surf Classic (QS 1500) and of course the Ballito Pro (QS 10000). That was the result today, with Kai winning both the JQS division and the Women’s division at the VW Nelson Mandela Bay Surf Pro pres by Billabong at Pollock Beach in Port Elizabeth. Not known as ‘The Windy City’ for nothing, the contest site had the full wind switch during the event, that made for some challenging conditions through a few of the finals. After blowing light onshore and making the waves difficult to find walls and thus high scores, there was a story that a gale-force west wind was heading up the coast. As forecast, it hit the contest site during the women’s final, causing the surfers to change their approaches somewhat. It didn’t faze young Kai though, who is used to surfing the waves of J-Bay in the howling offshore winds that are common there, and which see surfers carving off the top or turning mid-face to ensure that they don’t get stuck in the lip and blown off the back of the wave. Her approach was successful, and she put Sophie Bell, Anna Jellema-Butler and Olivia Izzard into the minor placings in the JQS final, and defeated Nicole Pallet in the Women’s final. It was an exciting men’s final, and a proud moment for David Van Zyl, who took the win from Adin Masencamp. Van Zyl is a hard-working WQS campaigner and this win might see him off on a trajectory that could get him into the big leagues that he is striving for. Without wishing to detract from Adin’s performance throughout the event – he was electric from his first heat – Van Zyl is relentless on the Qualifying Series, and this excellent result is just what is needed to get him fired up and winning more heats and events. He’s highly skilled in all conditions, charges when it gets bigger, and has the full repertoire of aerial moves when it’s smaller and punchy. Van Zyl could possibly be the next South African to climb on and represent on the Championship Tour alongside Jordy Smith and Michael February. 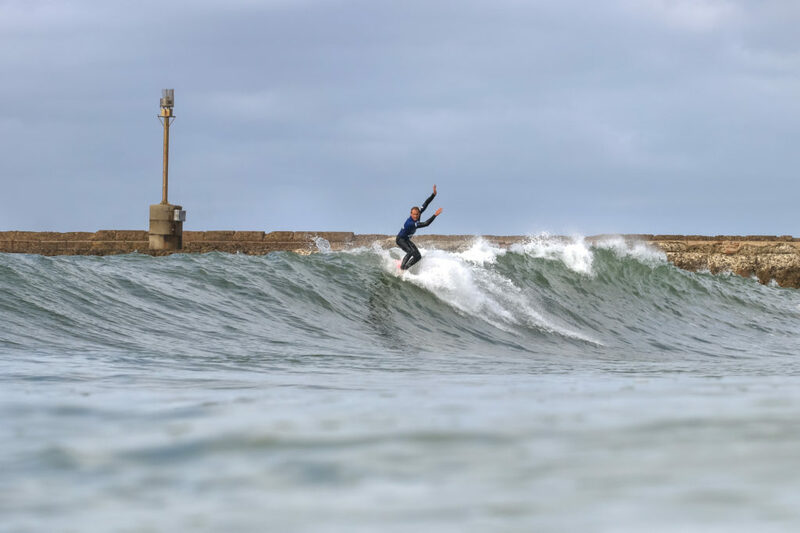 Port Alfred – Solid right-handers poured through for the final day of the Royal St Andrews Hotel Port Alfred Classic and it was the goofy-footers who displayed the best surfing all day in the chunky conditions. The right-foot forward duo of Josefina Ane from Argentina and South African Zoë Steyn paddled out for their Women’s QS 1,000 Final, and the waves continued unabated. While the big swell that was forecast for the day had still not materialized, the waves were highly contestable and the girls went to town. It was the international surfer Ane who showed her experience by banking an awesome display of surfing for a 6.25 and a 7.5 to put her in an unassailable lead total of 13.75. While young Steyn put on a valiant catch-up effort towards the end of the Final she was unable to better the Argentinean’s total, and bowed out in second place. By the time the Men’s Longboarding final hit the water, the predicted swell had started filling in, and the next two goofy-footers in Matthew Moir and Steven Sawyer spent some of their time dodging bigger sets and picking up the lined-up mid-size waves. Both of them were charging hard, but it was Moir who picked up the better waves, and banked some massive close-out turns on the inside, as well as a number of classic longboarding moves to sneak the win from Sawyer. After a long layoff due to injury, Sawyer was still incredibly stoked to be surfing a WSL Longboarding event in South Africa. Mens longboarding champion, Mathew Moir. a row, with Jordy Maree facing off against the Australian powerhouse goofy-footer Jordan Lawler. Both surfers were on fire during their Semifinal heats, with Maree surfing a fast and exciting heat against Dylan Lightfoot, showing no pressure as he unleashed his lethal backhand against his determined natural-footed opponent. At the end of the heat Maree proved the heel is mightier than the toe as his backhand power hooks outshone Lightfoot’s fast forehand carves. “I was just really glad the waves came to me during that heat,” said Maree afterwards. The second Semifinal was even more electrifying with the fresh-faced Australian Lawler coming up against experienced competitor and Championship Tour strategy-savvy Greg Emslie. Lawler started off with a great 8-point ride, but then he picked up a bomb running along the sandbank and unleashed. Lawler found rhythm and put together a series of radical backhand moves, carves and big hits, and finished off with a massive beyond vertical backhand crack to score the first 10-point ride of the event and leave the veteran in a combination situation at the end of the heat. The Final was an intense affair, with Maree putting on some incredible backhand surfing against the focused Lawler. A few bigger sets rumbled through the line-up during the final as the two surfers went toe-to-toe amongst the lined-up inside sections. Maree showed determination and perseverance as he put together a great show for the screaming local fans, being awarded a solid 7.25 for his best wave, and a back-up wave of 6.45 to give him a decent total and a hard reach for the Australian. Lawler put together an incredible series of radical backhand moves including a long re-entry to air-drop floater, but his 6.9 score wasn’t enough to get him the lead, and the very stoked and proud South African took his first QS win. Dylan lightfoot at firing Nahoon Reef. 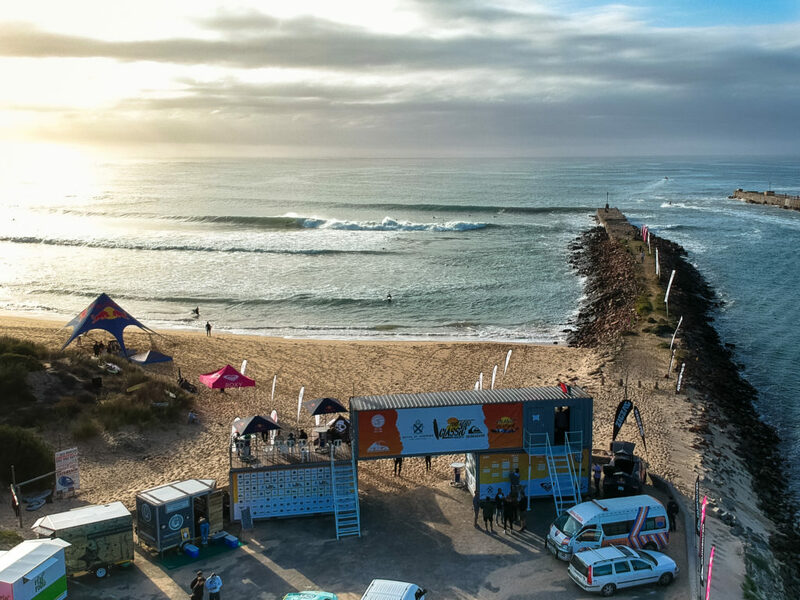 Nahoon Reef – It was a glorious April morning in East London as the competitors started filing in for finals day of the Mitchum Buffalo City Surf Pro pres by Reef Wetsuits. Despite the ominous forecasts of monster surf and onshore winds that had been swirling around the whole weekend, the swell filled in to about six-foot on a few of the sets, the wind puffed a little, backed off, and then disappeared altogether, and the waves fired throughout the afternoon’s pushing tide. Powerful, high-performance right-hand walls reeling down the reef for competitors to get busy with. Dale Staples, from St. Francis Bay, has been looking the business at this QS 1,000 event, and he continued with this streak by eliminating local legend and former Championship Tour competitor Greg Emslie from the event, despite breaking a board during their Semifinal heat. Staples has been groomed on the right-hand pointbreaks of his home turf, and has surfed East London’s Nahoon Reef enough times to know where to find the good ones. While not a massively-scored heat, (Staples won with 12.25 total) it was exciting and high-performance, with both surfers going all-out to impress the judges and claim the win. In the second Semifinal Diran Zakarian from Cape Town was in the lead for most of the heat, surfing impressively on his backhand in the excellent surf. Matthew McGillivray from J-Bay, currently the highest-ranked surfer on the International QS rankings, was left scratching for a back-up wave, which he found. A clean, walled-up bomb, on which McGillivray unleashed to extract a score of 9.25 and the heat win, to advance to the Final. Over at the JQS 1,000 the future of South African men’s surfing were laying it down, streaking along the excellent Nahoon walls, and going for broke on the sets. Spectators’ eyes were locked onto Mitch Du Preez, who had been surfing on-point the whole event, as well as on Luke Slijpen, who was hungry after missing the Royal St Andrews Hotel Port Alfred Classic last week. The placings changed throughout the Final, with Luke Thompson, Thomas Lindhorst, Du Preez and Slijpen all leading at some stage of the heat, but at the final siren it was Thompson winning from Lindhorst, Slijpen and Du Preez. Staples opened up the QS 1,000 final with an 8.5 in the high tide conditions, surfing powerfully and with confidence. He followed this up immediately with a great back up score of 7 points, and McGillivray was on the ropes and in deep in combo-land only a few minutes into the heat. Expecting the plucky J-bay surfer to fight back with tenacity, McGillivray unfortunately suffered an interference call with Staples, and with a zero score included in his tally, there was no way he could extricate himself from the runner-up position. A stoked Dale Staples emerged from the waters of Nahoon Reef as the Mitchum Buffalo City Surf Pro 2018 champion. A great start to the year for SA surfing woth three incredible events – all with insane waves. Best part for me was seeing the inclusion of longboard again and the crew came to the party with some of the best surfing on the series in the longboard heats. Next up the tour heads for Durban, then Lamberts Bay and Cape Town.